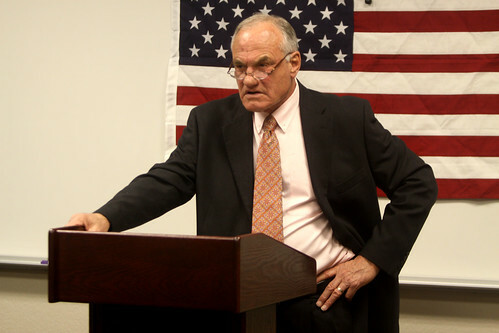 Former Congressman Barry Goldwater Jr., son of 1964 Republican presidential nominee Barry Goldwater, informed me via Facebook that there is “no truth” to the speculation that he will seek the Constitution Party’s 2016 presidential nomination. Goldwater, 76, represented the 27th and 20th Districts of California in the U.S. House of Representatives as a Republican from 1969 to 1983. Notably, during his tenure, he drafted the Privacy Act of 1974, which provided protections for personally identifiable information stored in government databases. In 2008, Goldwater backed the presidential campaign of Congressman Ron Paul in the Republican primaries. In that year’s general election a group of Paul supporters paid $500 to list Goldwater on the Louisiana ballot as the running mate of Paul. Though Paul publicly backed Constitution Party nominee Chuck Baldwin, the Paul-Goldwater ticket outpaced all the other third party tickets in Louisiana, including Baldwin’s. Paul-Goldwater appeared under the header “Louisiana Taxpayers Party,” borrowing from the ancestral name of the Constitution Party. The Founder of that Louisiana group, former IPR Senior Editor Trent Hill, who has ties to the Constitution Party, spurred Goldwater 2016 talk after mentioning that the Constitution Party was actively seeking to nominate a certain “big name” in 2016. Hill, who had correctly reported in November 2008 that then-Congressman Virgil Goode was interested in joining the Constitution Party to seek its 2012 nomination, flatly denied some suggestions, but did not initially rule out Goldwater. Eventually, Hill denied Goldwater as the “big name.” Former Republican Congressman Steve Stockman seems to be who Hill had in mind, though Stockman has yet to publicly express any interest in the nomination. According to Politics1, the current candidates for the Constitution Party’s 2016 presidential nomination are: Betsy Elgar of Washington, Jim Hayden of Tennessee, former U.S. Senate candidate Chad Koppie of Illinois, and Curtis Woolsey of Arizona. Virgil Goode and former vice presidential nominee Darrell Castle are listed as potential candidates. This entry was posted in Constitution Party and tagged 2016 presidential election, Barry Goldwater Jr, Betsy Elgar, Chad Koppie, Chuck Baldwin, Curtis Woolsey, Darrell Castle, Jim Hayden, Louisiana Taxpayers Party, Privacy Act of 1974, Ron Paul, Steve Stockman, Trent Hill, Virgil Goode on March 21, 2015 by William Saturn. Jr. generally shares his father’s disdain of the theocracy-minded Religious Right. He might be paleocon, but he isn’t particularly socially conservative. He also, like his father, supports legal abortion and gay rights, two things that would instantly kill any campaign for the CP nomination. On the whole he would be a closer for for the LP than the CP. He’s also, as you note, 76 years old, and he hasn’t run for office since 1982, so it was a pretty unlikely rumor to start with. Good job getting personal confirmation from him, though. Stockman would be a better fit ideologically (current PAC name: “Government Is Not God.”) but at the same time it’s doubtful he would do much better than Goode. He’s not a particularly well-known name outside of Texas, and there he’s mainly known as a joke. The way he ran his disastrous 2014 Senate campaign would be throwing up a lot of red flags if I were in the CP, particularly for those looking not to repeat the problems with Goode’s campaign. At the same time, I could see Stockman going for it, since his GOP career is as dead as dead gets, and he could probably secure the nomination, particularly if he gets some CP stalwart (Castle? Baldwin?) to be his running mate. Shame, Goldwater Jr. Is someone I’ve always admired and feel his career ended a bit abruptly. I think he ran for senate in California and finished third or so, and that was it. I recall there was some speculation that he was going to run for Arizona governor a few years back, but nothing came of that. Stockman is a bit um… eccentric, though ultimately I could also see him going for it. Though part of me hopes they’ll recruit a bigger name. Why not Roy Moore, given he’s in the news again? Sarah Palin would be the best choice for CP nominee. I just wonder why the Constitution Party doesn’t recruit Merrill Cook. He would be an interesting candidate. At age 76 it is no wonder to me why Barry Jr. is not interested. Unless Roy Moore gets removed from office again over gay marriage-related stuff, he won’t run. His term doesn’t expire until January 2019. He’d fit better in the Libertarian Party than the Constitution Party. Is there any rule saying Moore can’t run for President while keeping his state C.J. job? If he could do that, perhaps taking a leave from the court between the convention and election day, or if he winds up facing removal from office again (entirely possible), I could see him doing it. As loathsome as I find that vile snake, he’d be a pretty good fit for the C.P. as it exists today, and he would run a relatively high-profile campaign vs. whoever else the C.P. could nominate. He’s almost certainly got better name ID and popular support nationally than Goode ever did. There’s a history there, too: the CP tried to recruit/beg him to be their nominee in both 2004 and 2012. The Alabama C.P. even endorsed him as a write-in candidate after he lost the GOP primary for Governor. However, neither Stockman nor Moore have actually expressed any interest publicly. So until either of them changes that, the safest bet for the identity of the 2016 CP nominee is still Castle. Pretty sure Trent said it wasn’t either Goldwater or Stockman, although I would have to go back and look. Probably because the southern & eastern state affiliates would likely have a problem with a Mormon being on the ticket. Who says they haven’t tried? Yeah, honestly, if it’s going to be a “big-name” candidate, then it’s either Stockman, or Lynch. Lynch might go for it, yet his foreign policy views might conflict, plus I don’t know if he understands or knows all about the CP’s baggage and past history. Stockman would probably be more of a realistic fit for the CP. I agree with the points above that he would be closer to the LP, and at 76 and out of politics since the 1980s he’s unlikely to run in any party. If we’re looking at high-profile Christian conservative CEOs, the obvious two I’d think of would be David Green of Hobby Lobby (or one of his sons, since he’s 73), or Dan T. Cathy of Chick-fil-a. I don’t know if there would be any interest in that though, since both companies are trying to minimize their recently-politicized public image and get back to just being stores that sell overpriced crafts and tacky home decor, and that place that sells over-rated chicken nuggets and is inexplicably closed on Sundays. I’m sure the CP would love that, but from the other end it makes a lot less sense. This is Lynch’s plan to deal with ISIS. Doesn’t sound at all in conformity with the CP’s plank on foreign policy. As I said, maybe either Stockman or Lynch- but there won’t be anyone of a higher profile running on the CP ticket; since the CP doesn’t have much in terms of ballot access or financial resources to offer a wide-appealing, big-name candidate. Not like it used to in the early 2000’s. I still say CP would be better off trying to grab Carson once he falls off in polls. Or Hulk Hogan. Did anyone guess Sheriff Joe, and was an answer given on whether that was correct? That wouldn’t surprise me either. Someone did guess that, and I believe the answer was no. Neither is what we’re hearing from multiple CP affiliates on ISIS, so that isn’t necessarily such a problem anymore. Well, at least they are for less government on most economic issues. So much for ‘never compromising’ on ‘principle’. If this is the case, then they have thrown a core tenant of their ideology out the window now. I don’t believe Virgil Goode’s record is all that non-interventionist either. Yet Goode at least flip-flopped to conform to the CP’s stance on foreign interventionism. Maybe the next candidate they recruit will do that as well. Did Virgil Goode say whether he will run again? If someone had bothered to ask me, instead of bothering BGJr., I could’ve told you that there were no “rumors” about him. Guesses in IPR comments are “rumors,” I guess. The article does not use the word “rumors.” It mentions “talk” and links directly to it. I asked Goldwater back in January and he responded last week. Comments are fair game for “talk” and “speculation” IMO. I think those would be synonyms in this case. One thing is for sure, with the current shape the CP is in, having either Stockman or Lynch is probably a godsend for them to keep their party afloat in what states that they still have remaining ballot access. Well, at least they are still the fifth largest party in the US. Nationally, they are. Yet the California AIP, the New York Independence Party, the Oregon Independent Party, and the Green/Libertarian Parties of California alone are bigger in terms of voter registration numbers. Castle would probably do a better job for them than whoever they are trying to recruit but they probably won’t realize it. Explain why you think so, Rob. Compare the results of Baldwin and Goode. Or take an example from another party, McKinney and Stein.